The young United States had barely thrown off it's own colonial shackles when in 1805 it flexed its nascent imperial powers against what is now Libya. U.S. Marines captured the Eastern Libyan city of Darnah, raise the U.S. flag over it and forced the ruler in Tripoli to sign a commercial treaty with the U.S. before withdrawing. Since those days, wherever US Marines fight and kill, from Vietnam to Afghanistan, they proudly remember those early battles to put down the Barbary pirates and insure favorable trade relations "on the shores of Tripoli." Robbed of piracy as an income source the three areas which make up present day Libya, Tripolitania, Fezzan, and Cyrenaica, fell back under the control of the Ottoman Empire which had pretty much ran things there since the middle of the 16th century anyway. Libya rotted as a backwater of "the sick man of Europe" until Italy invaded and united the three areas as its colony in 1911. When Italy lost WWII, it lost its colony. It became the Independent and United Kingdom of Libya in 1951. It stayed a kingdom until 1969 when a 27 year old army captain Muammar Gaddafi led a military coup d'état, installed himself as dictator and promoted himself to colonel. Military power put Gaddfi in control and he has always shown a keen interest in increasing it plus he has the petrol dollars to buy lots. This has long made him a most favored customer of the international arms industry. In the beginning Colonel Muammar Gaddfi had gotten much of his weaponry from Russia and the Soviet Bloc. His reputation as a terrorist, his so-called socialism, his pursuit of WMD and the mistaken belief that he really was the "revolutionary" that he pretended to be all made him off limits to western arms merchants. But Gaddfi has shown a tremendous desire for all kinds of expensive violent instruments, and now we can see why, and he had billions in oil money to pay for it, so this was not a status that could be allowed to stand. So in the first half of the last decade the US, UK and EU insisted that Libya get rid of weapons that were a danger to them, namely it's nuclear weapons program, WMD and ballistic missile programs. These are weapons that most countries want for their national defense precisely because they can be used against an external threat. By 2005 Libya had met the disarmament requirements of the great powers. Since then those powers have been involved in a mad scramble to re-arm Libya with the type of weapons most useful to Gaddfi in suppressing his own people, weapons that are being used with terrible efficiency today. President George W. Bush ended the US trade embargo against Libya in 2004. President Bush sent Senator Joe Biden on Air Force Two to go and meet with Gaddfi. Of the deal he did with Gaddfi Biden said "The president of the United States asked me to go. He cut a deal with Gadhafi, directly. It was a smart thing to do." Biden called Gaddfi "the most candid guy I ever spoke with." Access to oil was always the principal reasons these great powers wanted to restore relations with Gaddfi but sale of weapons was also high on the list. In October 2004 EU foreign ministers went even farther than Bush and ended an 18 year restriction on the sale of weapons to Libya. Bush used the desire of U.S. companies to participate in the destruction of Gaddfi's chemical weapons to get the U.S. into that game. In September 2005 he waived some defense export restrictions on Libya to allow them to do this and also refurbish eight C-130H transport planes that had been purchased by Libya in the 1970's but never delivered. At the time Bush's spokesman claimed that a decision had not been reached to deliver the planes to Libya however they were being refurbished. Republican congressman from Pennsylvania Curt Weldon became a principal U.S. contact with Gaddfi about this time. He had long considered Saif Gaddfi his friend and says that Gaddfi's offer to give up WMD after the US invaded Iraq came to him through Saif in a London meeting in 2003. He was with Saif Gaddfi in Houston, Texas when Saif made his first trip to the U.S. and had a private meeting with Secretary Rice at the State Department. One day earlier President Bush made the first ever call by a U.S. President to Gaddifi, who had only been running Libya since Nixon was in the White House. Relations with Gaddfi were warming up nicely. 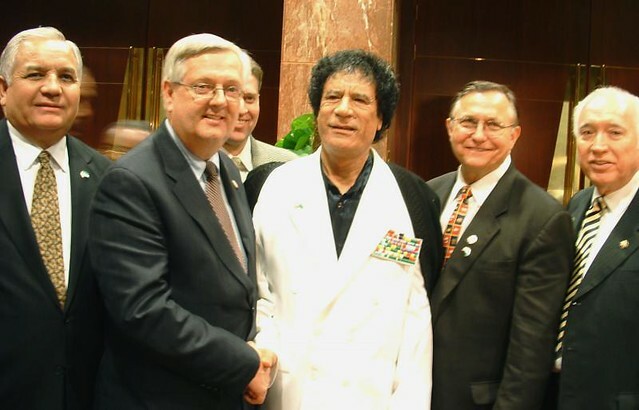 I led the 1st US Congressional Delegation into Libya in January 2004. My Delegation met with Col Ghadaffi for almost 3 hours resulting in his invitation to me to return in March to speak to the entire Libyan population at the Annual Great Jamahiriya. ( I told Col Ghadaffi that I would return and speak but would bring a good friend with me – Senator Joe Biden. Joe accepted my Invitation and spoke on the second day of the Great Jamahiriya. On my 3rd trip to Libya Saif and I Co-Chaired the 1st Multi-National Conference in Tripoli sponsored by the Oceans Security Initiative (OSI) which was attended by 300 representatives from over 30 nations. Saif and I had already Co-Chaired an earlier Conference by Satellite feed between our two nations. Libya is a success story for the United States. I am proud to call Saif Ghadaffi my friend. "The army now will have a fundamental role in imposing security and bringing normality into the country," he said. "We will destroy all these elements of sedition. We will not give up any inch of the Libyan territory." Comment: The concerted attention that xxxxxxxxxxxx devoted to military and security issues during recent meetings with Emboffs suggests that Saif is beginning to insert himself into the political-military and security spheres. The discussion of Khamis' requests in particular may indicate that Saif is trying to curry favor with his little brother. Given the fact that the "Khamis Brigade" is considered the best-equipped and most capable of defending the regime, it seems only natural that anyone intent on assuming power would try to align himself with Khamis. xxxxxxxxxxxx sought an explanation on the USG refusal of the sale of Little Bird helicopters to the Libyan military, and designated for the "Khamis Brigade." Stating that the Libyan military was still very interested in purchasing the aircraft, he suggested the helicopters have all armament removed so they could be categorized as "non-lethal equipment." DATT informed him that the Libyan military was free to purchase a number of other helicopter systems that the Defense Security Cooperation Agency had already cleared for Libyan military purchase. xxxxxxxxxxxx insisted that the Libyan military wanted to purchase the Little Bird helicopters. When you've got oil money and powerless citizens you can afford the very best helicopters. This week Gaddfi is using his helicopters in a very lethal manner. They are being used to shoot unarmed Libyan protesters from the air. After he left congress, Curt Weldon became the center of an FBI probe into alleged conflicts of interest while in office. That didn't stop him from becoming a principal in a private American defense consulting firm that did business with Libya, Defense Solutions. There he helped to broker deals between Libya and Russian and Ukranian weapons suppliers. Paradoxically, it was the "War on Terror" and efforts to rearm Afghanistan and Iraq, which had much Soviet-era weaponry, that created the ambiguities and loopholes that allowed this new arms trade to flourish. In the GWOT Effect of Arms for Dictators, the Center for Defense Information writes. The Libyan people are now paying the very terrible costs of that very profitable policy. To get the profitable contracts, Defense Solutions boasts an impressive list of advisers such as retired four-star general, White House drug czar and NBC News military analyst Barry R McCaffrey. McCaffrey's job now is to open doors like those of his friend David H. Petraeus, the commanding general in Iraq to Defense Solution's offerings. “That’s what I pay him for,” Timothy D. Ringgold, chief executive of Defense Solutions told the NY Times. General Petraeus has been a big advocate of increased U.S. weapons sales abroad. Under Bush's policies, relations with Gaddfi improved and companies like Defense Solutions got rich. On 30 July 2006, President Bush removed Libya from the State Department's list of countries sponsoring terrorism and shortly after that full diplomatic representation was restored. In December 2007 representatives of Lockheed Martin, Boeing, Raytheon and about 19 other U.S. companies made a visit to Libya sponsored by the National U.S.-Arab Chamber of Commerce. Lockheed Martin may be the Pentagon's biggest supplier but they are happy to sell to Gaddfi too. Thomas Jurkowsky, a Lockheed spokesman said about his company's war making capabilities "The opportunities to leverage that expertise in Libya cannot be overlooked." About the trip Christian Today said. Major U.S. companies are jockeying for tens of billions of dollars in infrastructure and other big projects in oil-rich Libya, as ties between the former foes warm. In January 2008, the former foes got even closers as Foreign Minister Mohammed Abdel-Rahman Shalgam met with Secretary of State Condoleezza Rice and became the highest ranking Libyan official to visit Washington in 35 years. "We don't speak anymore about war or confrontation or terrorism," Shalgam said after signing a U.S.-Libyan science and technology cooperation pact. "No, the contrary: Wealth of the people, cooperation, investments, peace and stability." Apparently human rights wasn't on the agenda either. "We will consider Libyan requests for defense equipment that enables them to build capabilities in areas that serve our mutual interest," said Lt. Col. Elizabeth Hibner of the Army. As examples, she referred to systems used for border and coastal security as well as "theater airlift," by implication aircraft such as Lockheed Martin Corp's C-130 Hercules that can ferry forces and equipment. "Theater airlift" would include the capability to fly in mercenaries from Chad to carry out mass murder in Libya. "Coastal security" might include naval capabilities that allow Gaddfi to fire on rebellious coastal towns from ships, as he has been doing, "border security" probably would include small caliber weapons and vehicles that the mercenaries are using once the "theater airlift" got them there. Gaddfi has planes made by Boeing and Lockheed Martin in his fleet. Boeing sold three 737 airliners to the first private Libya airline and began delivering in October 2006. What they would not consider selling to Libya are what might be called "weapons of national defense", the types of weapons that small countries would need to defend against imperial power. "Initial contacts between the two militaries have been very positive," Hibner goes on to say. Now that President Obama and Secretary Clinton are complaining that unlike with Egypt or Tunisia, they have no leverage or contact with the Libyan military we have to wonder just when it all went south. Six months after this "initial contact," Vice Admiral Jeffrey Wieringa, head of the Defense Security Cooperation Agency was peddling Humvees to a Libya delegation in his Washington office. Libya was not yet cleared for the sale of lethal weapons. "We've got some modest, non-lethal efforts ... that is progressing at a reasonable pace right now," he said. Wieringa's security cooperation agency brokers government-to-government arms sales with 218 countries or entities. War is big business. The United States may be the biggest arms merchant in the world but because of the embargo it is a relative new comer to the Libyan arms bazaar. It is scrambling to catch up. The European Union has gotten more of the business. In the two year built up to Gaddfi's massacre EU countries granted €687.6 million worth of Libya arms licenses. Belgium granted €18 million of licenses and Bulgaria €3.7 million. In 2009, the latest year for which we have figures, Malta shipped €79.7 million of small arms to Gaddfi's regime. Now the streets of Tripoli "are littered with the bodies of scores of protesters shot dead by security forces," and Malta is dealing with the blow-back of refugees trying to escape the hell that they so profitably helped to create. Belgian granted €4.4 million in permits for anti-personnel chemicals used to put down rebellions and Italy granted €2.6 million for bomb fuses, including improvised bomb fuses. Italy was the leader in what is known in the arms industry as "big ticket items." Italy granted €107.7 million of licenses for military aircraft. Gaddfi is now using his military aircraft to slaughter unarmed demonstrators from above. France granted €17.5 million worth and Portugal €14.5 million. Portugal also granted €4.6 million of permits for drones. In an effort to cover-up the massacre and stifle the opposition. Gaddfi has attempted to cut off all communications between Libya and the outside world including Internet, cell phones and even landlines. Internally he has been jamming the signals of Al Jareeza and other broadcasters. No doubt the €43.2 million in electronic jamming equipment from Germany and €20.7 million from England have been very helpful to him. Now as 10,000 or so EU citizens try to flee to safety, EU officials told EU Observer that their efforts to help them have been hampered by the jamming of mobile phone, Internet and GPS services by Gaddfi. Comment: The fact that York Guns and GOL officials have been vague about the intended end-use of the 130,000 Kalashnikov rifles raises potentially troubling questions about the extent to which Libya is still involved in supplying military materiel to parties involved in the Chad/Sudan conflict. End comment. The UK is certainly not missing this party. On his most recent trip to the Middle East, UK premiere David Cameron took along Ian King, the CEO of top British arms merchant BAe Systems and other executives from weapons producers Rolls Royce and Thames as part of his delegation. We can expect to find out a lot more about US, UK and EU complicity with this massacre once Muammar Gaddfi is forced from power. As British journalist Robert Fisk wrote in the UK Independent last week "If what we are witnessing is a true revolution in Libya, then we shall soon be able - unless the Western embassy flunkies get there first for a spot of serious, desperate looting - to rifle through the Tripoli files ... and reveal some secrets which ... [the UK government] would rather we didn't know about." "Government ministers claim they wish to support open and democratic societies in the Middle East but at the same time are aiding authoritarian regimes and providing the tools for repression. They don't just approve the sale of this equipment - they actively promote it. There should be an immediate arms embargo - but more importantly we should be asking why these exports were ever licensed in the first place." The US, the UK and the EU have a special responsibility for ending Gaddfi's violence against the Libyan people because it is their oil money that is paying for it. For four decades they took Libya's oil and they gave the money to Gaddfi knowing full well that it was not serving the people who were the true owners of the oil. Then they supplied Gaddfi with the weapons with which to maintain this robbery. This is not a civil war that is happening in Libya. Very few Libyans will fight for Gaddfi. That is why he has to hire mercenaries. This is a massacre of a largely unarmed people by a small cliche around one madman that has been enabled by great power money for mercenaries and weapons. The true responsibility for this mass murder lies as much with these great powers as it does with the madman.